Çontractual Rights :​They refer to a guaranteed set of rights given to all the parties (two or more) when they enter into a valid contact. They are clearly stated in the contract to avoid any future disputes, and all the parties involved have to abide by them. They usually involve business or trade matters, mostly sale and purchase of services and products; however they can include other subjects also. Example: Employment contract– It refers to a contract in which all the terms of employment are mentioned by the employer and later on accepted by the employee along with the acceptance of the job offer. It helps to avoid any future dispute. Written contracts are better than oral contracts because oral contracts are harder to prove when required. These rights exist with the existence of a contract and don’t have to be stated in the contract. They are implied by federal and state law and are not recorded because they are too obvious. •	Quasi Contracts- It refers to a contract where the benefiting parts knows or need to know that the benefit giving party expects a compensation for the benefit awarded or the service provided. The court allows this compensation even if there was no valid contract. 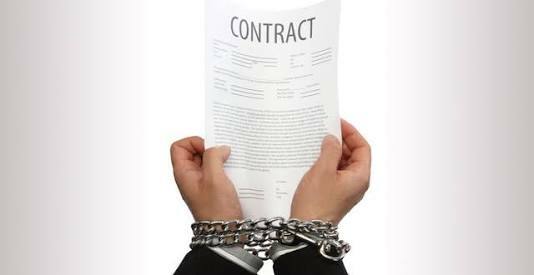 •	Right to be free from duress: Contracts formed without the consent of one of the two or more is consider invalid. •	Good faith and dealing: It states that there should be no deceptiveness or concealing of information between the parties involved in a valid contract. •	Right to be free from fraud: Any contract which involves fraud or hiding or misinterpretation of information is considered invalid.